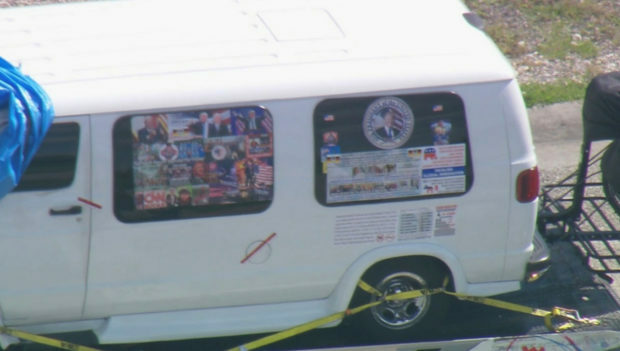 President Donald Trump addressed the pro-Trump stickers on the alleged mail bomber’s van while speaking to reporters on Friday evening. Cesar Sayoc Jr., 56, is suspected of sending at least 12 potentially explosive devices to Democratic leaders and public figures. He faces five federal charges and up to 58 years in prison if convicted. “The FBI, Secret Service, so many, they just got together and did a fantastic job. Like finding a needle in a haystack. So I want to congratulate them, as you know. I think everybody wants to congratulate them. They did a fantastic job. I’m going to North Carolina right now. It’s raining, so if you don’t mind, I’ll step out of the rain. I really — we’re very proud of law enforcement,” Trump said. 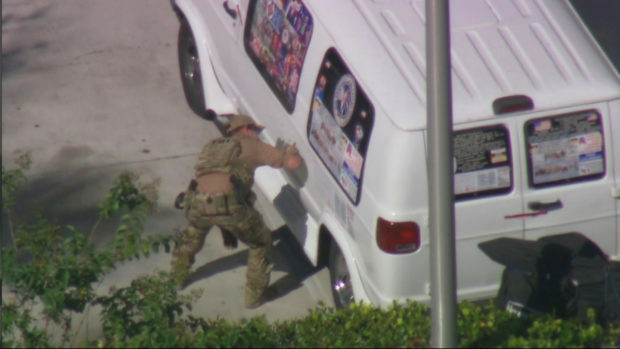 A reporter then asked him what his thoughts were about the suspect having Trump stickers on his car. “I did not see my face on the van. I heard he was a person that preferred me over others. But I didn’t see that,” the president stated. There are also reports Sayoc attended a Trump rally in 2017. Trump was addressing reporters prior to his departure to North Carolina for a rally on Friday night.